Icebox cake, is really not a cake at all; it’s layers of chocolate wafer cookies and whip cream. So, what’s up with the name? Once the cookies and the cream have a chance to sit together, in their little rows, the cookies soften and in a blind taste test you’d never know you weren’t eating cake. I am sure the version I ate as a child was made with Nabisco Famous Chocolate Wafers, which are still available (and still satisfy), plus Cool Whip. I loved it as a kid, but now my taste buds crave more flavor and a LOT less sweet. I added burnt sugar to the fresh whipping cream and baked my own bittersweet chocolate wafers. The homemade chocolate wafers make a big difference. They are intensely chocolate and less sweet, which gives the icebox cake so much more personality. Something old is new again and much tastier. When you slice into the icebox cake you reveal the beautiful stripes of caramel and chocolate. You can simply spread the top with the caramel whip cream, but for Easter or other holidays you might want to use a pastry bag and pipe a fancier design. As you can see I went a little Downton Abbey with my decorating, but either way this is one of the easiest and tastiest desserts I have ever made. ¾ cup (68g) cocoa powder (Dutch processed) – use a very dark cocoa or your cookies will not come out the classic color. You can even do a portion of black cocoa, but only a couple of tablespoons in place of the regular, or it is too bitter. Heat the cream to simmer, add the broken coffee beans, allow to steep for 15-30 minutes (depending on how strong you like it), strain and refrigerate for at least 2 hours. Whip when ready to decorate the icebox cake. In a large saucepan put the sugar in a mound in the center of the pan, be sure it doesn’t hit the sides. Gently add the water and corn syrup, making sure the sugar doesn’t splash up on the sides of the pan. Cook over high heat, without stirring. When the sugar starts to color on the edges, gently stir the sugar. Until it is quite dark, it will smoke a bit. I like my caramel very dark, with an almost bitter edge. Once the caramel is dark in color, reduce the heat and add half the cream. The caramel will sputter and seize up, which is normal. Gently whisk the caramel until the caramelized sugar dissolves. Add the remaining cream and stir. Strain the caramel cream into a shallow container. Cover and refrigerate until well chilled, at least 2 hours (the cream needs to be thoroughly chilled and thick before whipping. You can throw it into the freezer for 15 minutes before refrigerating to speed this up a bit, but make sure it is chilled throughout). Can be made the day ahead. In a medium bowl, whisk together the flour, cocoa powder, baking soda and salt. Add the dry ingredients to the butter mixture and mix just to combine. Add the milk and mix just to combined. The dough may be softer than what you see in my video, depending on the weather and flour you use. Form the dough into two 2-inch-thick logs. Wrap well in plastic wrap and refrigerate for at least an hour. To bake: Preheat oven to 350°F and line 2 baking sheets with parchment. Arrange on the cookie sheets with about 1½ inches between the cookies. Bake for 8 minutes and then rotate the trays back to front and switch from top to bottom racks. Bake for another 2 minutes or until they are dry looking and firm. Because the cookies are so dark, you can’t go by color on these. Allow to cool completely on a wire rack. 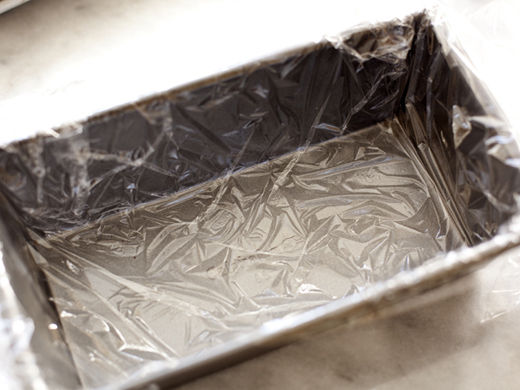 Line an 8×4-inch loaf pan with plastic wrap, set aside. In the instagram video I used a small pullman pan because it has straighter sides. Using a hand or stand mixer, whip the chilled caramel cream until very soft, slouchy, peaks. Be sure not to whip the cream in a plastic bowl or it may not whip properly. Reserve the remaining 1/3 of the cream for topping the cake. Whip cream on a lower speed for a longer time. If you whip the cream on medium speed, instead of high, you will have a smaller air bubble and the cream will have more stability. This will also prevent some over whipping. See my instagram video to watch me whip the cream properly. Coat the bottom of the prepared pan with about a ¼-inch-thick layer of the cream. Line the outside of the pan with the cookies. You should end up with about 3 rows of cookies and cream. This may vary slightly depending on how large your cookies are. Cover the top with more of the cream, so the cookies are completely covered. Refrigerate the cake for at least 3 hours or overnight. Invert the icebox cake onto a serving platter. 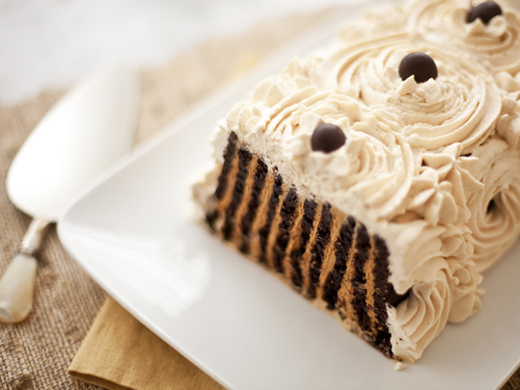 Whip the coffee cream and decorate the icebox cake as you wish. Make the caramel whipped cream: In a large saucepan put the sugar in a mound in the center of the pan, be sure it doesn’t hit the sides. Gently add the water and corn syrup, making sure the sugar doesn’t splash up on the sides of the pan. If any of the sugar is not dissolved, very gently stir, but make sure none of the sugar hits the sides of the pan. Cook over high heat, without stirring. When the sugar starts to color on the edges, gently stir the sugar. Until it is quite dark, it will smoke a bit. I like my caramel very dark, with an almost bitter edge. Once the caramel is dark in color, reduce the heat and add half the cream. The caramel will sputter and seize up, which is normal. Gently whisk the caramel until the caramelized sugar dissolves. Add the remaining cream and stir. Strain the caramel cream into a shallow container. Cover and refrigerate until well chilled, at least an hour. Can be made a day ahead. Make the chocolate wafer cookies: Cream together the butter, sugar, brown sugar and vanilla until light, about 2 minutes. Add the dry ingredients to the butter mixture and mix just to combine. Add the milk and mix just to combined. Slice the log of cookie dough into ⅛-inch-thick coins. Arrange on the cookie sheets with about 1½ inches between the cookies. Bake for 8 minutes and then rotate the trays back to front and switch from top to bottom racks. Bake for another 2 minutes or until they are dry looking and firm. Because the cookies are so dark, you can’t go by color on these. Allow to cool completely on a wire rack. Line an 8x4-inch loaf pan with plastic wrap, set aside. 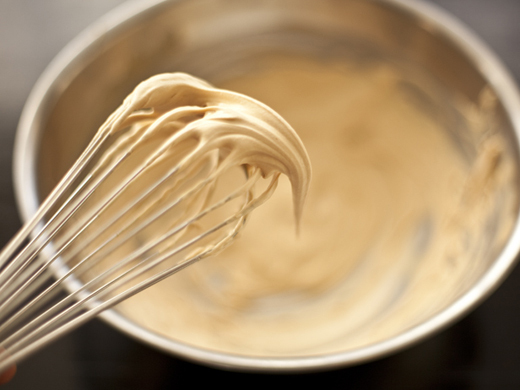 Using a hand or stand mixer, whip the chilled caramel cream until very soft, slouchy, peaks. Be sure not to whip the cream in a plastic bowl or it may not whip properly. Reserve the remaining ⅓ of the cream for topping the cake. Whip cream on a lower speed for a longer time. If you whip the cream on medium speed, instead of high, you will have a smaller air bubble and the cream will have more stability. This will also prevent some over whipping. 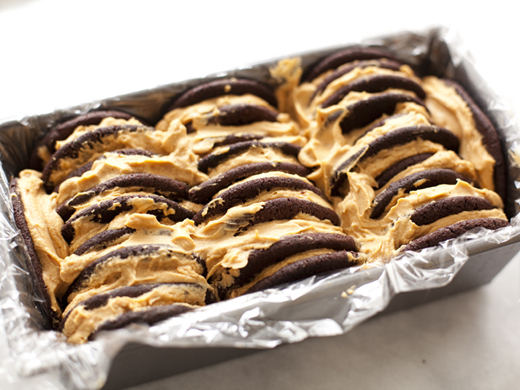 Spread a layer of the cream on each cookie and layer them together in the pan. You should end up with about 3 rows of cookies and cream. This may vary slightly depending on how large your cookies are. Make the coffee whipped cream: Heat the cream to simmer, add the broken coffee beans, allow to steep for 15-30 minutes (depending on how strong you like it), strain and refrigerate for at least 2 hours. Whip when ready to decorate the icebox cake. Decorate the icebox cake as you wish. *or skip this step and buy pre-made wafer cookies. Just be sure to buy 2 boxes since some are bound to be broken. 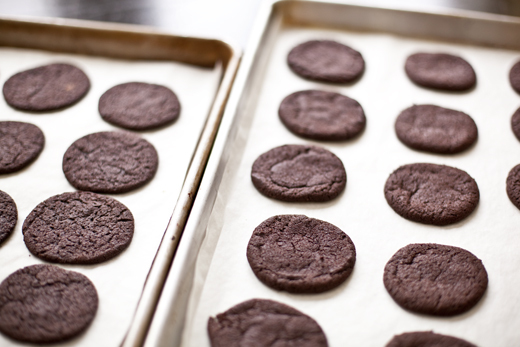 **use a very dark cocoa or your cookies will not come out the classic color. You can even do a portion of black cocoa, but only a couple of tablespoons in place of the regular, or it is too bitter. ***In my icebox cake instagram video I added a bit of coffee to the mix and did the outer layer of cream with coffee beans. this looks absolutely fabulous. Your posts are always a visual treat in the midst of a focused day. Um. I just completely abandoned my own cooking projects for this one. The caramel cream threw me over the edge. Divine. The first one I made was gone in a matter of minutes, so I made another one just to have around. It lasted for a few days and still tasted great, but the cookies just got a bit softer. This looks heavenly!! I’m sold, totally have to make this. Really gorgeous. I admire your patience and artistry, Zoe!!! Beautiful Zoe!! Your flavor combinations are out of this world… I am drying to try this! Shaina, I’ll be right over. Yum! I love the sound of that caramel whipped cream and can’t wait to try it! 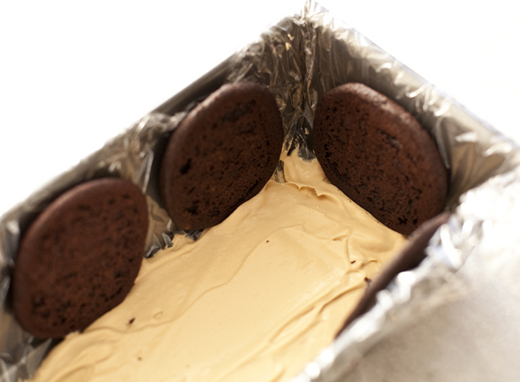 That ice box cakes looks great even without the frosting! This looks divine. And the caramel whipped…mmmm. Doesn’t get better then that. This is beautiful! Such a unique cake. I have yet to make an icebox cake, but I’ve always been intrigued with them. I think this one is just the inspiration I needed — it’s gorgeous! And I just know my kids will love it — thanks! This looks so good! And I absolutely love that you said you went ‘Downton Abbey’ with your decorating. That made me laugh. Looks divine. I am a cook, not a baker so i am going to cheat and try it with Anna’s cookies. Zoe, this looks amazing! The hard thing for me would refrain myself from eating all the wafer before putting the cake together – they look so good! Heading to the store to get ingredients now! Can this be made ahead and frozen until the “party day”? The cream will break down, so it is best made a day or two ahead and kept in the refrigerator. I also have a couple “do-ahead” questions..how long will the cookie dough keep in the fridge? Also, will the caramel cream (not yet whipped) be okay in the fridge for a couple days? The cookie dough can be made ahead and stored in the refrigerator for a few days or in the freezer for longer. The cream can be made about 2 days ahead, as long as it is not whipped. Was the cream very cold and thick when you started? How long did it whip? Thanks for your anwser Zoe! The cream was very cold and semi-thick. Not thick but not watery. In the begining it took a long time to whip and after that weird white chunked started to form. Like little white specks that grouped in some places. When I took some into my hand it was like butter. It actually sounds like it was over whipped and went to the butter stage. It really should take that long for it to thicken. If you submitted your Icebox Cake photos to http://www.foodporn.net , I’ll bet they will make you on the home page. I just made this cake. I, like the other poster that tried to make it, couldn’t get the cream to whip for the life of me. I ended up with a clotted, somewhat runny looking mess. It wasn’t over whipped, because it didn’t get through the whipping phase at all. It tastes good, but I am not really sure what I did wrong. I am experienced in baking, making caramel, and whipping cream…but clearly they don’t go together for me. 🙁 I am not giving up, but it’s a sad mess today. Better news. I whipped the remaining cream, as I had made the cake the day ahead, and it whipped beautifully. So, maybe your comment was right about the mixture needing to be much colder. My next question is this: How do I get the cream to keep it’s piped shape for more than just a little while? The family thought it was very tasty. I am so glad that it whipped up better for you the next time. I will make a note of that. Did the cream lose its piped shape after it was on the cake or did you want to pipe more on the cake later? I just made the cake, and like Confounded, I couldn’t get the cream to whip to soft peaks. It was more of a thick cream. I chilled it for 7 hours, and I hope that it will be sufficient to hold the cake together. That being said, the flavor of the whipped cream is divine! I am serving it tomorrow for Shavuot, so hopefully it will look presentable. 1. When you cooked the sugar was the caramel as dark as my pictures show? 2. When you whipped the cream, what speed are you whipping it? 3. What kind of heavy cream are you using? So the cake tasted wonderful, but it kind of fell apart as we cut into it. The whipped cream whipped better 24+ hours later, but anything piped didn’t stay well…my friend who helped me decorate ended up just smoothing everything out in the end. (We decorated it and kept it refrigerated until serving.) To answer your questions, the color was nearly as dark as yours, I whipped it at speed 4 out of 5, and I used 38% whipping cream. Despite the messy look, everyone loved the cake. I wonder if it might help to freeze it next time? So glad you enjoyed it! Thanks for getting back to me with all the details. Helpful to know it was better at 24 hours. How long did you refrigerate the cake before you cut into it? I made the cake the day before, so maybe 20 hours or so. And then we decorated it about two hours before serving it (and it was in the refrigerator for those two hours). Love your recipes. Have used several with much success! I am interested in using the chocolate wagers in a caramel tiramisu to substitute for the lady fingers. I’m wondering if they will be too dense with a heavy custard like that used in tiramisu. Any advise? I think you may be right about them being dense, unless you were to break them up and use them as a layer of crumbs, but I’d do this sparingly, almost in addition to the lady fingers for a bit of chocolate. I made this using Nabisco Famous Chocolate Wafers and it turned out great. I didn’t let the melted sugar caramelize long enough to get the deep flavor and colour. For me, 2 cups of heavy cream was plenty. I chilled the cream over night and whipped it at a medium-low setting on my KitchenAid. It took longer than I thought to get the peaks, I needed to be more patient! Next time I’ll make the chocolate biscuits as well. The cake was gone in an instant and I got rave reviews, thank you for sharing! I’m so thrilled you tried it! Boy, I had a bad time whipping that cream too. Don’t know if it has anything with the caramel or if I was just unlucky. The cream was quite liquid when I started, but then it went from liquid to complete butter, no half point. I didn’t have any cream left so I just ate the cookies, lol. 🙁 But I’ll give it another shot someday. Thank you for the update, so glad the cream worked out this time. Do you think it was just a matter of whipping it longer? Try the cookies with some nutella or even a scoop of ice cream! I have made this recipe twice. The first time I had a really hard time getting the caramel cream to whip to soft peaks. It turned out more like thick runny cream. Everything was ice cold (it had chilled overnight). Put it in the freezer and we ate it frozen so it was still great to eat. The only heavy whipping cream I have available is the ultra pasteurized, so I thought that was the problem. Made the recipe yesterday – same problem. Then realized that I had been using a plastic bowl – switched to a stainless steel one and the cream whipped right up! We still froze it because our boys like it better that way. Hope this helps anyone having the same problem. This is amazing info, thank you so much for letting me know. I will try the recipe in a plastic bowl and see if I have the same reaction.